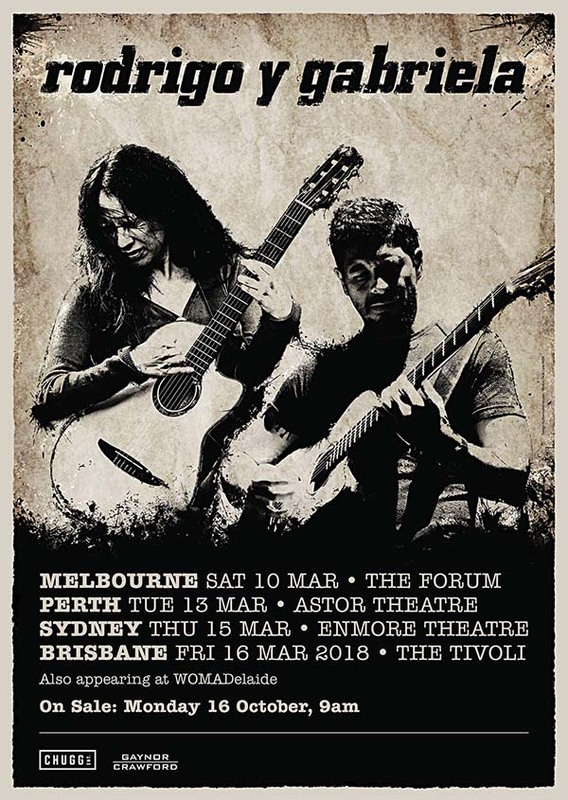 Two years on from their last Australian tour, celebrated Mexican instrumental virtuosos Rodrigo Y Gabriela return to Australia to play national theatre shows in March 2018. Making their debut appearance at WOMADelaide on Friday 9th March, the duo will take in Melbourne, Perth, Sydney and Brisbane. One of the most critically acclaimed acoustic instrumental bands in the world, Rodrigo y Gabriela have sold in excess of 1.5 million albums globally, and have packed out iconic venues around the world, from the Hollywood Bowl and Royal Albert Hall to the Sydney Opera House, Red Rocks Amphitheatre and Le Zenith in Paris. 2014’s 9 Dead Alive was praised by music critics and fans the world over. Unmistakably Spanish in sound, the duo also showcases influences as diverse as metal to rock to world music.